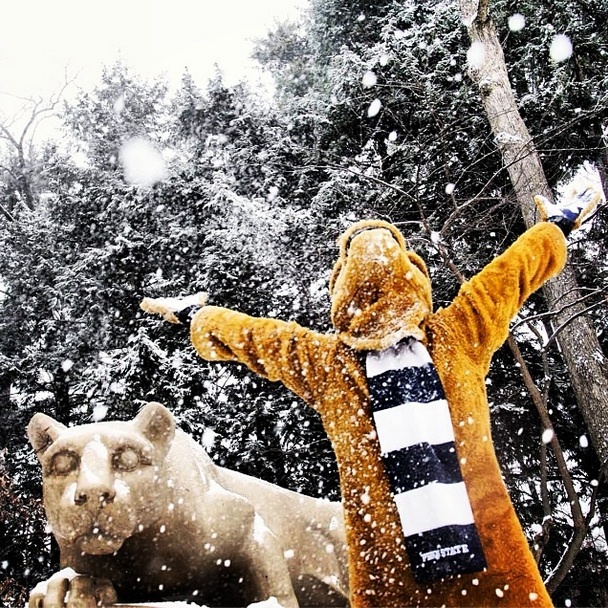 Cool cats: Hey, it’s snowing in State College today. It’s been doing a lot of that lately. On Saturday (when it was also snowing), our friend Bill Zimmerman from the Public Information office in Old Main got this terrific shot of a couple of Lions frolicking in the white stuff. If you haven’t already seen it, enjoy. Honored, again: QB Christian Hackenberg and tight end Adam Breneman have been named True Freshman All-Americans by 247 Sports, the latest postseason honors bestowed on members of the Nittany Lion football team. If you’re scoring at home, the list from just the past few days includes all-Big Ten honors for eight players from ESPN and BTN; first-team All-America notice from CBS Sports and the Sporting News for junior receiver Allen Robinson; and team MVP honors for senior defensive tackle DaQuan Jones. Dog, gone: Readers of a certain age will remember Nipper, the attentive dog whose iconic image became the symbol for record-player manufacturer RCA Victor. For more than half a century, a stained glass version of Nipper—four of him, actually—overlooked the city of Camden, N.J., from his perch atop the RCA Victor factory. Those windows came down more than 40 years ago, and somehow one of them ended up at Penn State. Today, the Daily Journal has the story of how the window we’d kept in storage on campus recently returned home to South Jersey. It’s a fun story, not least because the historian charged with the window’s safekeeping is named Pane. Entry filed under: Uncategorized. Tags: Adam Breneman, Allen Robinson, Bill Zimmerman, Christian Hackenberg, DaQuan Jones, Nipper, RCA.